I'm guessing you are using perhaps snagit 13? Here's some images for you. No, actually I am on 2019. 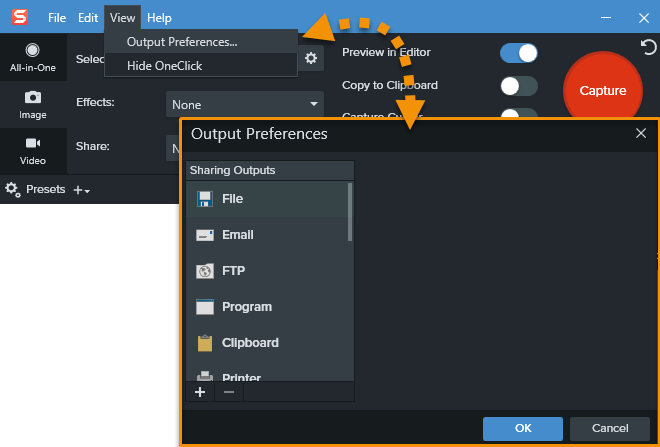 So in the editor all preferences are handled together, but in capture the Outputs are separated from the other preferences. So I'm in for the shock if I ever go to Snagit2019... not happening until they change their pricing model and fix all the previous faults... lol as if! Bonkers sounds like a great word for it! Or perhaps they need a continuity /design team? I see why you're frustrated! 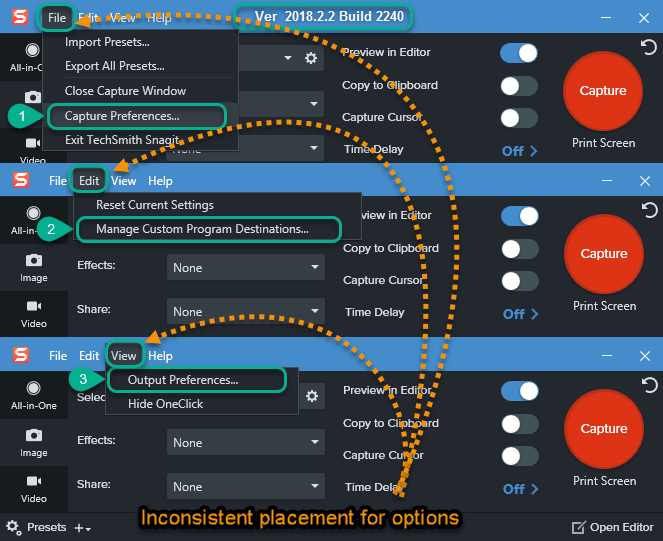 Early last year, we conducted a card sort usability test with users to determine the most logical order for all of our Editor menu items, but we didn't run a similar user test on the Capture window menu items. So, that's probably why the Preferences options are found in separate menus between the two (and also why various preference-related items are found across multiple menus, as Damian pointed out). We'll look at making these more consistent and reducing some of those redundancies in a future release. Thanks for bringing this to our attention! For anyone else that is curious like I am, here is a link describing what this "card sort" test is.